The Purepecha language, previously known as Tarascan, is a language isolate that is not even provisionally linked with any other language. It is spoken in the state of Michoacan near Lake Pátzcuaro and the Paricutín volcano. There are two main varieties (that of the lake area vs. the volcanic plateau) and perhaps a dozen minor ones. Speakers can easily identify each other by their speech as to their region, and even their home village. Speakers take pride in keeping their local variety even if they have moved to another part of the region. The word order of Purepecha is most commonly Subject-Object-Verb. Long words containing many suffixes and even more than one root are common. Vowels that fall at the ends of words are often voiceless or are dropped altogether. The elevation of the Tarascan villages varies from 5200 feet (1600 meters) above sea level to over 8200 feet (2500 meters), with Lake Pátzcuaro (Mexico's highest lake) at 7200 feet (2200 meters). Temperate climate, fertile soil and pine forests dominate the area. The rainy season is from the end of May to September, and, at higher elevations, January and February bring frost but rarely snow. Nearly all villages specialize in some particular cottage industry: furniture, copper products, guitars, violins, pottery, ceramics, bricks, adobe, wooden utensils, hats, mats, masks, etc. These are marketed in towns and cities, and some even internationally. Some villages take pride in their distinctive dress, including ornately stitched aprons and blouses. Nearly all women wear shawls, but many use western clothing. Purepecha music is very viable. Many songs are popular elsewhere in Mexico; for example, the song Flor de Canela (“Cinnamon flower”), which is Tsitsiki Urhapiti in Purepecha, is sung throughout Mexico. There are dozens of Purepecha music tapes and CDs available in the area. 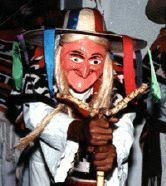 Many traditional dances, such as the Danza de los Viejitos (“Old-folks’ dance”, pictured above), are well preserved from precolonial times and are presented at special occasions. Most children attend at least the first few years of elementary school, of which the first two grades are taught in Purepecha. Although illiteracy rates are high among older people and women especially, there are many highly-educated Purepechas: priests, doctors, nurses, lawyers, linguists and anthropologists. Vocabulary published by ILV, A.C.